The two sectors of the Navy which were quite inadequately developed on 7 December 1941 were logistics and intelligence. The primary reason for the logistical deficiency was that the officers of the Line of the Navy had taken only a cursory interest in logistics in the years just before World War II. This occurred because in the day by day peacetime Fleet operations, there were few really large difficult logistical problems demanding command decisions. Consequently, logistical matters were handled mainly by officers of the various excellent Staff corps, particularly the Supply Corps. So the command corps, the Line, lacked skill and experience in handling logistical matters on a large scale. The secondary reason for the logistical deficiency in the Navy was that no one had ever been able to free the seagoing Navy from the thinking that its operations should be on an austere basis in the field of logistics. It was quite unprepared mentally for wartime operations with their tremendous actual expenditures and waste, or to use the cover-up word for waste, "slippage." Both the intelligence and logistical sectors received a great war influx of citizen sailors. These citizen sailors soon found that their sectors were rated by the professional officers of the Line as markedly less important than the command and operational sectors of the naval effort. The penalty for the failure of the professional officer to adequately evaluate intelligence and logistics in pre-World War II days was a massive take over of these important wartime functions by officers with little or no naval knowledge or experience in the vast waterlands of the world to provide balance to their technical judgments. The United States Navy's concept of logistics broadened mightily during the early months of World War II. The pre-World War II experience in logistical austerity, combined with the multiple handlings arising from the nature of amphibious operations and the juxtaposition of waves, coral, sand and hot sun, provided the pertinent background for the Navy's initial logistical inadequacies in the Lower Solomons. In the early amphibian operations, there were no LSTs or LCTs and very few DUKWs.2 The guts of logistical support for the first phase of WATCHTOWER had to be winch-lifted out of the deep, deep holds of large transports and cargo ships, and loaded like sardines into small landing craft dancing on the undulating seas, and then hand-lifted and piled at a snail's pace onto the beaches by tired sailormen or by combat oriented Marines who, with rifle in hand, might better have been pressuring the retreating and scattered Japanese. in the utilization of all available cargo space as "commercial loading" but was essential. And the transport Captains learned a second phase of the complex problem at Guadalcanal and Tulagi. For no matter how hard the planners had planned and how skillfully the Transport Quartermaster had loaded, it was almost inevitable that actual operations would turn out to be different than planned operations, and real and pressing needs would arise for changes in the Marines' priorities for unloading the logistical support. Logistics got off to a bad start in the South Pacific and in WATCHTOWER, the area's first operational venture. This occurred because of several questionable logistical decisions made outside the South Pacific Area, relating to time and distance, as well as because of an inadequate appreciation of logistical problems by those within the SOPAC Area. A particular problem was the need to move logistical support bases forward as operations were undertaken to halt the enemy and, if possible, move him backward toward Japan. During the early months of 1942, the naval activities of South Pacific island bases, even though they fell within the CINCPAC command area, generally made direct application to the logistic agencies in the United States for their support. They did this rather than apply to Pearl Harbor since Pearl Harbor did not have material resources to spare or even personnel to handle the heavy logistical communication load. were on the same island, these differing instructions from the higher echelons were confusing. In other words the assigned Army, Army Air Corps, Naval, Marine, and New Zealand forces for these island bases did not have Unified, or Joint, logistic support. Each Service at each island base had individual procedures for its logistic support. At Pearl, before WATCHTOWER was much more than a gleam in Admiral King's eye, CINCPAC recommended to COMINCH a definite division of responsibility between the Army and the Navy for logistic support of each individual base in SOPAC by categories of supply.7 In other words, he wanted a system wherein every island base received its bailing wire from the Navy and every island base received its coffee from the Army. It is presumed the SOPAC recommendation was made because COMSOPAC as well as his senior logistical commander, COMSERVRONSOPAC, and a Joint Purchasing Board were all physically located in Auckland at the time. It apparently was approved by higher echelons because Auckland was the only SOPAC base considered safe from Japanese attacks at that date. But Auckland was 1,100 miles further from San Francisco than Tongatabu; it was 1,825 miles from Guadalcanal and 250 miles farther from Guadalcanal than the Tonga Islands. Captain Mark C. Bowman, U.S. Navy (1909), had been established with its headquarters at Auckland, New Zealand. When COMSOPAC's recommendation making Auckland the Supply Center for SOPAC was approved, requests from the island bases, which were all north and northeast of Auckland, had to be sent, most by airmail, the thousand or more miles south to Auckland where they were coordinated and sent on north again, many via airmail, past the various bases on to Subordinate Command, Service Force, U.S. Pacific Fleet in San Francisco. In mid-July 1942, the Army and Navy in Washington agreed upon and promulgated a "Joint Logistic Plan for the Support of United States Bases in the South Pacific Area." This Joint Plan, which followed CINCPAC' s recommendations in general, stipulated which Service would be responsible for furnishing items common to both the Army and the Navy. It was just coming into effect when WATCHTOWER suddenly imposed its logistical burdens upon the SOPAC island bases. The new Joint Plan was similar to its predecessor in calling for the screening of all requests from island bases by the Joint Purchasing Board in New Zealand to see if they could be fulfilled from local SOPAC resources. Thus it retained the potential for long shipping delays in SOPAC logistical support. Superimposed upon the logistical tasks of carrying through WATCHTOWER was the problem of logistic planning and preparing for the operations to follow WATCHTOWER. Rear Admiral Turner had always had the comprehensive mind and the talent for remembering a million details which together are the earmarks of the first flight working logistician. When he "hauled awrse" from Guadalcanal-Tulagi on the afternoon of 9 August 1942, he was saddled with a hundred worries about ships and sailormen lost--by what, if any, dereliction of his own self he was not clear--and with a thousand worries about the 10,000 good Marines for whom he could no longer provide minute by minute logistic or other direct support. McCawley on the 8th of August, it was decided that the latter, with Captain Peyton and Colonel Linscott of the TF 62 Staff, would visit Tulagi, ascertain the situation there militarily and logistically and then CTF 62 would confirm or change the departure hour for the transports already tentatively set for 0600 of the 9th. Major General Vandegrift did not get back aboard the McCawley until 0908 on August 9th at which time it was mutually agreed that the transports would depart about 1330. This was only the first of many difficult operational decisions based on logistical factors which Rear Admiral Turner would make in the next six months. Not knowing that Rear Admiral Turner, his senior subordinate at Guadalcanal, had already started TF 62 forces south toward Noumea, Vice Admiral Ghormley had ordered the withdrawal of all surface ships at Guadalcanal by 1830 local time on the 9th,11 and informed his subordinates and superiors that there were indications Japanese Landing Forces were proceeding toward Guadalcanal on 9 August.12 This latter despatch, it is believed, did nothing to ease the mental strain on the amphibians, or to quiet the mind of the Commanding General of the First Marine Division. Despite the fact that the transports had done a commendable job within the limited hours of unloading available, Rear Admiral Turner knew that the Marines would be unhappy that they were not getting 100 percent of the logistic support which had arrived for them off Red Beach and Blue Beach.13 It was apparent that the problem of getting to the Marines the supplies not landed would be the first order of business. Commenced preparation for the hospitalization of wounded, transferring and equipping of survivors, and logistics plans for supply of forces in the CACTUS-RINGBOLT [Guadalcanal-Tulagi] Area. Transports and AKs proceeding with unloading and rearrangement of cargo in order that essential supplies may be forwarded to CACTUS [Guadalcanal] for quick unloading. Rear Admiral Richmond Kelly Turner, USN, taken at sea, 1942.
of logistics support.14 The lack of such a logistically trained officer during the previous month was another contributory factor to the inadequate logistic plans for WATCHTOWER. Rear Admiral Turner had planned tentatively to shift his flag ashore at Guadalcanal, when the McCawley was withdrawn to Noumea, after unloading during WATCHTOWER.
. . . Command of this Force shall be shifted to a land base in the Tulagi-Guadalcanal area, after establishment ashore by the Marine forces. All Staff functions will be conducted from this land base until such time as the permanent garrison is established and the Amphibious Force is released to proceed with further operations. At the time this draft was written, it was assumed that the communication facilities of the McCawley would be available at Guadalcanal long enough for CTF 62 to conduct the initial stages of the HUDDLE (Santa Cruz) Operation as well as to follow through on the anticipated initial surge of despatches regarding logistic support of WATCHTOWER. The [TF 62] Headquarters radio station will be established using the First Marine Division TBW radio equipment. Support that this 'second guess' decision was correct and that the radio facilities being taken into Guadalcanal were inadequate, even without CTF 62's communication load, is found in the extracts below from a four-page mailgram picture of the Guadalcanal communication situation on 28 August 1942. Naval communication facilities available in the Solomons on 20 August 1942. Radio facilities are daily becoming more inadequate. Captured Jap receiver utilized to copy FOX. We hope to improve our situation somewhat by the repair of a Japanese 2 kilowatt transmitter. Guadalcanal logistics over the long haul centered on troops, planes, food, ammunition, and aviation gas, but during the first two weeks, getting the airfield into condition to operate aircraft received highest priority. This latter chore the Japanese had not quite accomplished. intelligence over great credit. But to make ready the airfield by this date certainly put the heat on the Marines who landed on Guadalcanal-Tulagi on 7 August. By 12 August the landing strip was usable and by 20 August, Henderson Field with two squadrons of operating Marine aircraft was in business and would remain so throughout the war. The days and nights of August and September 1942 were full of TF 62 logistics and of fighting to permit the flow of TF 62 logistics through to its most important element--the Marines on Guadalcanal. It is necessary to recount just a few of the main events for background. Task Force 61, under Vice Admiral Fletcher, acting as a Covering Force for the cargo ships Fomalhaut and Alhena carrying the first large load of logistic support to Guadalcanal, fought the indecisive Battle of the Eastern Solomons on 24 August 1942, which resulted in the Enterprise being bomb-damaged. The Saratoga unfortunately was damaged by a submarine torpedo on 31 August. The Marines, within their perimeter on Guadalcanal, were placed under heavy attack at the Battle of the Bloody Ridge on 12-14 September. Task Force 65 under Rear Admiral Turner's command with 4,000 Marine reinforcements, the 7th Marine Regiment, made a delayed landing on 18 September on Guadalcanal, but battleship North Carolina, carrier Wasp and destroyer O'Brien from the Covering Force all were torpedoed by submarines on 15 September. The Wasp was lost, and the O'Brien went down more than a month later while enroute to the United States for battle repairs. The worry and concern over the logistical situation at Guadalcanal and the heavy naval losses sustained in maintaining the flow of logistic support extended up and down the command chain of the Navy, and to the Army and its air arm.
. . . Ghormley and other Naval officers in that area--Admiral John ('Slew') McCain and Admiral Daniel Callaghan--were very worried about the situation there. It was obvious the Navy could not hold Guadalcanal if they could not get supplies in, and they could not get supplies in if the Japanese bombers continued to come down arid bomb the ships unloading supplies. As I traveled through the Southwest Pacific, it was impossible not to get the impression that the Navy was determined to carry on the campaign in that theater, and determined to do it with as little help from the Army as possible. The Chief of the Army Air Corps carried news of the worried state of the naval commanders in the South Pacific Force back to Washington, where he arrived on 2 October 1942, having covered 21,000 miles in 12 days. While his solution to the Admirals' problems was far from being similar to theirs, he served a most valuable purpose in alerting the home folks in Washington that there were SOPAC and Pacific problems crying for early assistance. And to this statement many naval logisticians would say "amen." My anxiety about the Southwest Pacific is to make sure that every possible weapon gets into the area to hold Guadalcanal, and that having held in this crisis, munitions, planes and crews are on the way to take advantage of our success. It now appears that we are unable to control the sea area in the Guadalcanal Area. Thus our supply of the positions will only be done at great expense to us. The situation is not hopeless, but it is certainly critical. It did not take the stress and strain of active operations very long after 9 August 1942 to demonstrate that the naval logistical organization in the South Pacific was inadequate both in concepts and in capabilities. This last statement is a basic logistical principle and it actually took only three weeks to have it fully accepted by all echelons in SOPAC which could be some kind of a record. However, accepting the principle in a command 9,000 miles from Washington, and actually applying it to logistic support largely under the control of other naval commands or to logistic support on a Joint or Combined basis, were quite different things. And the fact was that logistics had not gone hand in hand with operations; the WATCHTOWER Operation had gone ahead with logistical support hurrying along well behind. For logistical support in the South Pacific to flow evenly and adequately, the Navy needed Advanced Bases that were reasonably stocked. These did not exist on 7 August 1942. The Advanced Base at Efate, 285 miles north-northeast of Noumea, started on 4 May 1942, had gotten a good head start on Noumea and a two months' head start on Espiritu Santo, but it was 700 miles from Guadalcanal. Efate was a small but going concern in early August 1942, the airfield having been used since 28 May 1942, and its underground aviation gas tanks shortly thereafter, but it could not begin to support WATCHTOWER all by itself. directed the establishment of a branch of the First Marine Division Base Depot at Espiritu Santo, utilizing the services of the Quartermaster of the 2nd Marine Regiment, that the Marines on Guadalcanal could begin to plan on having at some long-distant date back-up logistical support only 500 to 600 miles away. It was not until LION One arrived on 10 February 1943 that major realistic steps were underway to make Espiritu Santo into a full-fledged Advanced Base Supply Depot. From May through July 1942, Noumea functioned as a logistical staging area for Efate and Espiritu Santo after making a false start as a fuel depot for an Advanced Naval Base in late June 1942. Beginning in mid-August, it then grew like Topsy. On 11 November 1942 the Navy started major construction of an Advanced Base Construction Depot at Noumea and the necessary port development to permit the proper functioning of the nearly all-inclusive logistic support facilities projected. The established, but largely not built and not stocked, main Supply Base at Auckland, New Zealand, 1,825 miles to the south. A small Advanced Air Base without supply support facilities at Efate in the New Hebrides, 700 miles southeast of Guadalcanal. A considerably larger Advanced Naval Air Base at Espiritu Santo 560 miles southeast of Guadalcanal in the earliest throes of being built and stocked. Direct shipment from continental United States. The facts were a bit different at least in one respect. Actually, then, it took only half of three months, until September 18th, before the Marines were placed on full U.S. rations. No Marine or Army soldier ever seemed to have quite enough logistic support during WATCHTOWER, but the major essentials of battle--adequate men, rations, aircraft, bullets, bombs and aviation gasoline--were always present on Guadalcanal although the reserve stocks rode the sine curve roller coaster with distressing speed. Noumea was a logistical bottle neck. It lacked berthing space, storage space, unloading equipment and adequate numbers of skilled or unskilled longshoremen. The port was not organized on a Joint basis, and until this was done in November 1942, each Service competed at Noumea for use of each ingredient of logistical support. The lack of unloading facilities at Guadalcanal Island was one more logistical problem. All logistic support had to be lightened to the beaches, where it was painfully and slowly unloaded, then reloaded on to some type of moving vehicle, and moved to the Marine or Army Supply dumps. But the biggest logistic bottleneck, in this scribe's opinion, was the basic lack of know-how by the Navy concerning logistical support for a big operation six thousand miles away from a United States source of supply. The only consolation to be derived from this is that, had the logistical problem been fully appreciated, it is doubtful whether the WATCHTOWER Operation would have been undertaken when it was, which was just in time to obtain success. When discussing the problem of logistic support on Guadalcanal, it is worth mentioning that both the United States Navy and the Japanese Navy had problems in providing it from their nearest advanced base area. To accomplish this support the United States Navy had about a 50 percent longer sea run than the Japanese Navy until, after long months, a supporting base was created and stocked at Espiritu Santo. The Japanese Navy on the same day provided supplies in woven baskets to both the United States Marines and to the Japanese, the Marines getting four out of six air drops. It was the next day before the Japanese landed 200 troops and their logistic support from a single destroyer. when the store ships Alhena (AK-26) and Fomalhaut (AK-22), the McFarland (AVD-14) loaded with aviation gasoline drums, and six APDs loaded with rations arrived at Guadalcanal on 21-22 August 1942, and landed over 2,000 tons of logistic support including 200 tons of rations, some personnel of the 2nd Marine Regiment, and their equipment and supplies. During October 1942 logistic support ships were unloading at Guadalcanal-Tulagi on 13 days of the month. By December there were one or more support ships unloading on 31 days of the 31-day month. But during the last 20 days of August, the Marines had seen this pleasant sight only on six days. It is a logistic truism that there is nearly always a conflict between those who ship and those who ask for the shipment, and this was reemphasized at Guadalcanal. In war, logistics is always a worry factor. Many times it is the chief worry factor and at times it is the only worry factor. Quotes from Rear Admiral Turner's letters support this truth. When Vice Admiral Halsey made the decision, shortly after assuming command of SOPAC, to shift the building up of a Main Fleet Base in the South Pacific from Auckland, New Zealand, to Noumea, New Caledonia, he accomplished more in cutting the Gordian Knot of the SOPAC logistical problem, than any of the many of hundreds of other actions taken for this purpose. His recommendation to this end went forward on 21 October 1942.40 While negotiations to obtain buildings and area for this purpose had to be carried out with the Free French via General De Gaulle in London who controlled New Caledonia, the approval for the move was not too long in arriving. On 8 November 1942, SOPAC Headquarters was established ashore, and Noumea commenced striving to fulfill the logistical mission and functions previously assigned to Auckland. The saga of the building of the Guadalcanal-Tulagi base area has yet to be written, but this base area played a vital role in the logistic support furnished by COMPHIBFORSOPAC to the Marines and Army troops on Guadalcanal and to the later operations in the middle and upper Solomon Islands. So, because of the importance of bases in connection with amphibious operations, the story of its early trials and tribulations should be told in some detail. Despite this advance planning, neither COMSOPAC nor COMPHIBFORSOPAC mentioned a prospective Advanced Naval Base at Guadalcanal-Tulagi in their WATCHTOWER Operation Orders. COMSOPAC's Op Order had no section on logistics. COMPHIBFORSOPAC Op Order had a Logistic Section, but did not include any information about an Advanced Base. The nearest mention was when COMPHIBFORSOPAC provided for a Naval Local Defense Force with a lieutenant commander of the Coast Guard in command at a headquarters ashore. Lieutenant Commander D. H. Dexter, USCG, actually did go ashore with the Marines, but his command included only picket boats (landing craft), a harbor signal station and a small landing craft repair crew. This created the certainty that Rear Admiral Turner would step on the toes of the Marines. CUB One, containing the essential units from which an Advanced Base could be built, left San Francisco on the day before Rear Admiral Turner left Pearl Harbor. 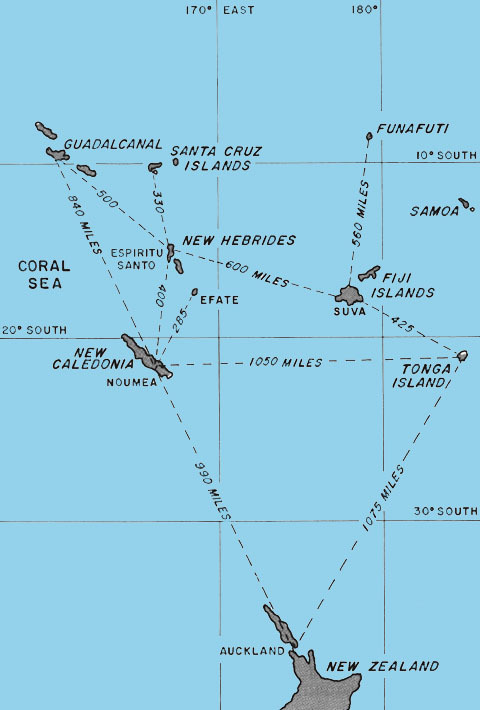 Its orders were to report to Commander South Pacific and its destination was New Caledonia, but enroute the four ships carrying CUB One were diverted to Espiritu Santo Island in the New Hebrides. Commander James P. Compton (1916), who had served with Vice Admiral Ghormley in the Naval Observer Unit in London, England, was the Commanding Officer of CUB One. He took command on 8 July 1942 at Moffett Field in California, the day the unit sailed for the South Pacific in two transports and two merchant ships via Pago Pago, Samoa. It arrived at Espiritu Santo on 11 August 1942. Upon arrival at BUTTON [Espiritu Santo] I reported by despatch to COMSOPAC. No immediate orders from him. After I had been there a couple of days, I was ordered by COMSOPAC to fly to Noumea. He was aboard ship. I talked to Ghormley and his C/S Callaghan and to Colonel Peck on the Staff. I was told the base was to be built at Guadalcanal-Tulagi--no instructions as to when to go forward. I did not even know that I was to work for Kelly Turner. He was in the harbor when I was there, about 15 August, and had I known I was to work for him, I would have gone to see him. I did not then or later receive any orders to report to COMPHIBFORSOPAC. I did not know anything about Savo happening and I was not told when I got back to Espiritu Santo. I assumed that I was sent out with the CUB-One equipment so as to help any way I could in the South Pacific. I had some aviation equipment so I landed gasoline trucks etc., to help out at BUTTON, plus gasoline drums. My arrival at Espiritu Santo resembled the arrival of Santa Claus on a playground with a full bag. The staff of General Rose [commanding at Espiritu Santo] assembled in my tent daily to determine the items they wanted. The primary purpose of CUB One, as I understood it, was to establish air bases and supporting facilities. This was in accordance with CINCPAC' s supporting plan, which was about the one piece of official paper I received upon arrival at BUTTON. First people in CUB One to go to Guadalcanal--an Ensign George Washington Polk two Seabee warrant officers and a 100 plus men--arrived on 15 August 1942. CUB One with the aviation personnel set up in the allowance list would have required stripping personnel from all available sources. It was the first indication to me that I had command of a paper tiger. At about this time a radio order from COMSOPAC was received to establish a base at Espiritu Santo. COMCUBONE was an action addressee. I got a despatch from Kelly Turner to go up to Guadalcanal on the fast transports--Hugh Hadley's ships [Transport Division 12]. I gave him machine guns from CUB One to mount on his ships. I took some doctors . . . communicators and pay clerk and the CO of Seabee Battalion Six [Lieutenant Commander Paul Blundon (CEC)USNR]. On 27 August 1942, I embarked for Guadalcanal and arrived 29 August. My people were scared. Everybody was scared. I set up my headquarters near Henderson Field where the earlier elements of CUB One had been established. We moved our camp after the shelling of the airfield, toward the beach. The Seabees had most of their equipment on a civilian ship, the Santa Anna, a Grace Line Ship. I sent a despatch to Kelly Turner to have the SS Santa Anita, the ship I thought best suited for the Guadalcanal situation, to come to Guadalcanal but he thought no civilian manned ships should go up at that time. The Seabees aided the building and repair work at Henderson Field and my aviation personnel acted as ground crews and fueled the planes. Aviation gas drum storage records were kept and with this information, I was the only one in Guadalcanal that really knew [the amount of] gasoline available. My unit gradually took over Island Communications. We, plus Dexter's original outfit, operated landing craft, housed units such as Black Cats, transients, and maintained a base at Tulagi. Rear Admiral Turner expected the skipper of CUB One to start building an Advanced Naval Base as soon as possible and this required him to develop a specific plan for the Guadalcanal-Tulagi area soon after his arrival. of the Advanced Naval Bases of the forward areas in the South Pacific. This officer would be a subordinate to the officer who had these tasks in addition to many other logistic tasks for the whole SOPAC area, the Commander Service Squadron, South Pacific Force. Rear Admiral Turner also became convinced that there should be established an Advanced Naval Base at Guadalcanal-Tulagi, not just an Advanced Air Base, and that an officer with some seniority should be ordered to it. On 5 September 1942, he committed his views to paper,54 including recommendations that Commander James P. Compton, U.S. Navy, the Commanding Officer of CUB One, be ordered as Commander Advance Bases CACTUS-RINGBOLT (Guadalcanal-Tulagi) and that an officer of appropriate rank be ordered to command each of the two bases in this base complex. Both of these recommendations were carried into effect by COMSOPAC, Commander Compton being ordered as Commander Advanced Bases CACTUS-RINGBOLT on 11 September 1942 and to the command of all Naval Activities in the area on 13 September 1942. It was more than another two months, however, before Commander H.L. Maples (1917) arrived, in December 1942, to command Naval Base, Lunga, which by May 1943 grew into the Advanced Naval Base Guadalcanal. or duty. This sound principle was extended to Gavutu-Tulagi on 28 October 1942 when Pinger' s relief, Lieutenant Commander John C. Alderman (1928), was given orders to report to Brigadier General William H. Rupertus, USMC, the senior officer present on Tulagi. On 27 November 1942, Commander William G. Fewell (1921) took over the Advanced Base at Tulagi from Alderman and only a month later, on 26 December 1942, he, in turn, was relieved by Commander Oliver O. Kessing (1914), soon to be promoted to captain. Thus at the Gavutu-Tulagi Base, there were four different guiding influences in less than five months. At Guadalcanal, where the commander of the two bases in the area had his headquarters, there were three changes of command at this level in the same period. There were also three changes at the Lunga Base command level since the first two over-all commanders also commanded what in effect was the Lunga Base. Rear Admiral Turner proceeded by air on 11 September to Guadalcanal, together with Rear Admiral McCain (COMAIRSOPAC) and the Commanding Officer 7th Marine Regiment and members of their staffs. The group returned to Espiritu Santo on 13 September and CTF 62 departed by transport on 14 September for Guadalcanal with the 7th Marine Regiment. a 42-plane Japanese air strike occurred at 1150, 12 September, and put the main radio receivers on Guadalcanal out of commission for 32 hours. The night of 12 September, Guadalcanal was shelled by a Japanese light cruiser and three destroyers, and the first probing actions of the Battle of the Ridge occurred. On the 13th of September, Japanese planes made passes at Henderson Field just before and after Rear Admiral Turner departed Guadalcanal. On 29 August, 357 officers and men of the Sixth Naval Construction Battalion (part of CUB One) embarked in the cargo ship Betelgeuse for Guadalcanal. This meant that two weeks after the initial landings about 480 personnel of CUB One had been started forward. On 28 September 1942, in a letter to Major General Vandegrift, Rear Admiral Turner wrote in regard to preparing Guadalcanal as "our Major invasion base:"
On 30 September 1942, Commander Compton reported that 47 officers and 878 men of CUB One were still in Espiritu Santo, and he furnished a list of the tasks they were engaged in.59 On 5 August 1942, CUB One had reported a strength of 139 officers and 1,828 men. Services and operations immediately required by the current tactical situation. Development of naval facilities as required by CINCPAC Secret Serial 09910 of 8 July 1942. In other words, Commander Compton, for what he believed made very good reasons, still was not moving towards the building of an Advanced Naval Base, but rather toward an Advanced Air Base. In his letter of 24 October, COMPHIBFORSOPAC recommended that a new title, Commander Advanced Naval Bases, Solomons, be given to Commander Compton and that he be provided with a six-man staff. COMSOPAC agreed that a new title was desirable but decided that the new title should be Commander Naval Bases, Forward Area. This got away from the limited concept of an Air Base. the disposal of the Commanding General, First Marine Air Wing aided the aviation units in repelling air and surface attacks. You took over immediately the multiplicity of duties connected with the preparation and maintenance of the Naval and Air facilities at this station. These duties you have discharged in an outstanding manner. By your unceasing efforts, complete cooperation and willingness, you have made an invaluable contribution to the success of operations in this area. In early November 1942, Rear Admiral Turner applied to COMSOPAC for the services of Captain W. G. Greenman (1912), the Captain of the ill-fated Astoria (sunk at Savo Island) who was still in the SOPAC area. COMSOPAC ordered Captain Greenman as Commander Naval Bases, Forward Area, and Commander Compton as his Chief Staff Officer. Congratulations on being assigned to your new job. You may or may not like it--so you should know that I recommended you for it, worked like hell before we got you, and am now trying to have you made a Flag officer so you have appropriate rank as Commander Advanced Naval Base, CACTUS-RINGBOLT. 'Advanced Naval Bases Solomons' does not seem to be acceptable to the boss, nor does 'Commander Naval Activities, Solomons' fit the bill. Captain Greenman lasted but a month (7 November-12 December 1942) as he developed pneumonia and had to be shipped back to Pearl Harbor. Personal letters indicated that Captain Greenman was trying hard to get officers of appropriate seniority ordered in as Commanding Officers RINGBOLT and CACTUS. Guadalcanal was a tough area for the health of oldsters. Captain Greenman was 54, and Captain Shock, 50. Commander Compton was only a bit younger, at 47. There was no adequate Base Plan developed by higher echelons of command prior to the assault landing. The Base Area was under Japanese gunfire or air attack a far greater number of times during the first four months of building than other bases. There was a definite lack of appreciation by the officer in over-all charge, Rear Admiral Turner, of the part that defensive tasks were playing in absorbing the time and energies of the Base Commander. The lack of a clear mission at the Base Commander's level, with the immediate senior in command (Major General Vandegrift) being primarily concerned with work which would contribute promptly or directly to his offensive or defensive potentialities, and the next senior in the chain of command (Rear Admiral Turner) keeping a constant eye to the future use of the Base. COMPHIBFORSOPAC, COMSERONSOPAC) all sending despatches and letters direct to the Base Commander. 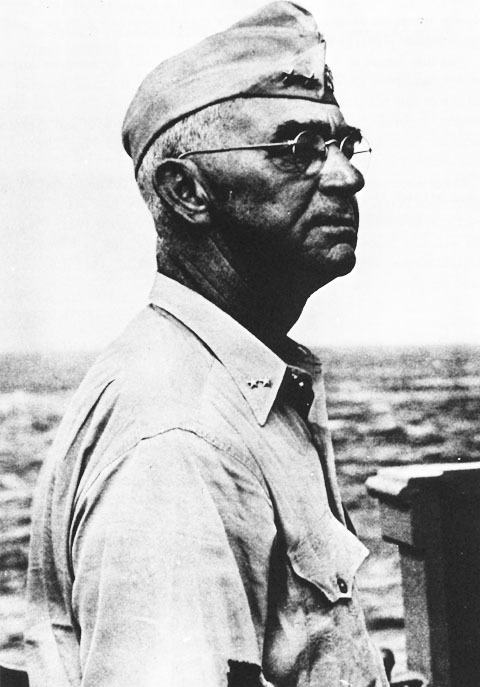 Rear Admiral Turner, far from seeking to enlarge his area of responsibility, or believing in the desirability of his being the appropriate responsible senior, or enjoying his responsibility to build up the Advanced Base at Guadalcanal-Tulagi, was anxious to transfer the responsibility to a more appropriate commander. Less than a month after he had been handed the hot potato, he felt strongly enough in the matter to seek a change. From the safe distance of 27 years, it may be pointed out that none of the operation orders dealing with WATCHTOWER issued by naval command echelons prior to the landing provided for scheduled or automatic resupply over the first 30 to 60 days of the operation. These orders contained no particular details regarding the follow-up movements for the tremendous logistic support which would be involved in building an Advanced Air Base, or the other essential facilities of a small Naval Operating Base at an overseas location. CINCPAC issued his orders for building the Advanced Air Base by CUB One on 8 July 1942 but the Commanding Officer of CUB One did not receive a copy of it until after the landings of 7 August 1942. This is logistics at its very worst, when the support forces are a month late in getting the word about the operations. 2. LST--Landing Ship Tank; LCT--Landing Craft Tank. In the 1943 operations these landing ships and craft ran directly up onto the beach and waterproofed wheeled vehicles or tanks unloaded through bow doors. When depth of water or beach gradient did not permit this type of unloading, they ran up onto hastily constructed "hard" ramps or dropped their nose doors onto beach grounded pontoon barges. DUKWs. These amphibious trucks could be loaded aboard ship, unloaded by winch or launched out of bow doors and move through the water up onto the beach and inland surmounting the surf and riding over reefs or through swamps. 5. Ballentine, U.S. Naval Logistics in the Second World War, p. 99. 6. COMSOPAC Op Plan 1-42, Logistic Annex. 7. CINCPAC to COMINCH, 250225 Jun. 1942. 8. COMSOPAC to CINCPAC, 260551 Jul. 1942. 9. COMINCH to C/S USA, letter, FF1 A16/CF1 Ser 00105 of 18 Feb. 1942. 10. COMSERVRONPAC to COMSOPAC, 220655 Aug. 1942. 11. COMSOPAC to CINCPAC, 090830 Aug. 1942. 12. COMSOPAC to CTF 62, 090551 Aug. 1942. 14. (a) McCawley Ship's Log; (b) Staff Log, 19 Aug. 1942. 16. Commanding General First Marine Division (Vandegrift) to RKT, letter, 12 Aug. 1942. 17. (a) COMPHIBFORSOPAC, Tentative Command Order, no date; (b) CTF 62, Op Plan A3-42, para. 5(c); Annex K, para. 2. 18. (a) Turner; (b) Staff Interviews. 21. Henry Harley Arnold, Global Mission, p. 338. 26. Ibid., p. 348. Time late September 1942. 27. C/S AAF to C/S USA, memorandum, 6 Oct. 1942. OPD 384. Modern Military Records Division, National Archives. 28. RKT to Major General Vandegrift, letter, 23 Aug. 1942, p. 2. 29. COMSOPAC to COMSERVRONSOPAC, 301110 Aug. 1942. 30. CTF 62 to TF 62, letter, FE 25/NT6/A4-2/Ser 0056 of 20 Aug. 1942. Subj: Establishment of Marine Advanced Supply Depots. 31. Time Magazine, 7 February 1944. 32. COMGENFIRSTMARDIV Final Report on Guadalcanal Operation, Phase III, Annex C.
33. (a) Ibid., Phase V, Annex T; (b) Hough, Ludwig, Shaw, Pearl Harbor to Guadalcanal (Marines), pp. 311-13. 34. COMPHIBFORSOPAC to COMSOPAC, 090 Sep. 1942 and referenced despatches. 35. (a)) COMSOPAC to COMPHIBFORSOPAC 082140 Sep. 1942 and related despatches; (b) COMINCH, letter, FF1/A3-1, Ser 001006 of 18 Sep. 1942; COMINCH 261302 Sep. 1942; CINCPAC 120635 Nov. 1942; (c) COMPHIBFORSOPAC, letter, A3-1 Ser 00394 of 17 Nov. 1942, subj: Proposed return to Pacific Coast of AP's and AK's temporarily assigned the South Pacific Force. 36. (a) COMAIRSOPAC to COMGENGUADALCANAL, 130623 Aug. 1942; (b) RDO Tulagi to RDO Auckland, 159459 Aug. 1942; (c) COMSOPAC to CINCPAC, 231301 Aug. 1942. 37. RKT to Captain W.G. Greenman, letter, 7 Nov. 1942. 38. RKT to General Vandegrift, letter, 16 Nov. 1942. 39. (a) CTF 62, letter, FE 25/A16/Ser 029 of 23 Aug. 1942 and replies thereto from transports and cargo ships and commands; (b) COMSOPAC, letter, A16-3/(00) Ser 00936 of 4 Dec. 1942; (c) TU 66.3 Op Orders J-1, K-1, K-2, H-1, incorporating trial revisions. 40. COMSOPAC to CINCPAC, 210517 Oct. 1942. 41. FIRSTMARDIV Final Report on Guadalcanal Operations, Phase V, Annex T., p. 2. 42. CINCPAC Basic Supporting Plan for Advanced Air Bases Santa Cruz Island and Tulagi-Guadalcanal, Ser 09910 of 8 Jul. 1942. 44. COMSOPAC to COMPHIBFORSOPAC, 080826 Aug. 1942. 45. CNO letter, Ser 018753 of 25 Aug. 1942, subj: LION and CUB bases. 46. (a) Interview with Captain James P. Compton, 1 Feb. 1962; Memorandum from Captain Compton, 17 Jun. 1969. Hereafter Compton; (b) COMSOPAC, 022310 Aug. 1942. 47. (a) Compton; (b) C/S/ COMPHIBFORSOPAC to RKT, Memorandum of 26 Aug. 1952. 48. RKT to AAV, letter, 23 Aug. 1942. 49. (a) C/S/ COMPHIBFORSOPAC to RKT, memorandum of 26 Aug. 1942; (b) COMSOPAC, despatches 072206, 231326 Sep. 1943; (c) COMPHIBFORSOPAC to COMADVBASE CACTUS-RINGBOLT, letter, 15 Sep. 1942. 50. JPC to RKT, letter, 8 Oct. 1942. 51. COMCUBO to COMAIRSOPAC, letter, 27 Sep. 1942. 54. COMPHIBFORSOPAC to COMSOPAC, letter, Ser 00116 of 5 Sep. 1942. 55. CTF 62, letters, P16-4/00, Ser 0027 of 5 Aug. 1942; and P-16-4/00, Ser 0023 of 5 Aug. 1942, subj: Lieutenant Pinger's orders to the Local Defense Force, Sub-Area. 56. (a) COMSOPAC 072206 Sep., 061345 Nov. 1942; (b) COMGENCACTUS, letter, 13 Sep. 1942; (c) CNO, OP-30-B3, letter Ser 0291930 of 7 Nov. 1943, 1942 and references. 58. RKT to AAG, letter, 28 Sep. 1942. 59. (a) AC/S to CTF 62, memorandum, 27 Aug. 1942; (b) COMADVBASE CACTUS-RINGBOLT to COMAIRSOPAC and COMPHIBFORSOPAC, letters of 27 and 30 Sep. 1942. 60. COMPHIBFORSOPAC to COMSOPAC, letter, FE25/Ad-1/0032 24 Oct. 1942, with enclosure from COMADVBASE CACTUS, no ser, undated. 63. RKT to Captain W.G. Greenman, letter, 7 Nov. 1942. 64. (a) Commander Naval Bases South Solomons Sub-Area, Command History, p. 79; (b) Personal letters COMSOPAC to CINCPAC. 65. RKT to Captain T.M. Shock, letter, 24 Dec. 1942. 66. South Solomons Sub-Area, Command History. 67. COMPHIBFORSOPAC to COMSOPAC, letter, Ser 00116 of 5 Sep. 1942. 68. Ghormley manuscript, p. 13. 69. COMSOPAC, 061345 Nov. 1942. 70. Vandegrift, p. 221. Reprinted from Once a Marine with permission of W.W. Norton & Co., Inc.
72. Interview with Commodore Thomas G. Peyton, USN (Ret. ), 22 May 1961. Hereafter Peyton. 73. Admiral Ernest J. King to SECNAV, 23 Apr. 1944. 74. Commander Transport Division Eight (Captain George B. Ashe) Report of Operations 17-18 Dec. 1942.